At the 2015 Frankfurt Motor Show, Mercedes announced the official debut of second generation C-Class Coupe, Mercedes Benz C300 Coupe 2017. It has been pretty long that the three-door hatch received revision and gets something that actually make it look like a coupe. Finally the most awaited thirst gets its shape and is ready to compete with Audi A5 and BMW 4 series. 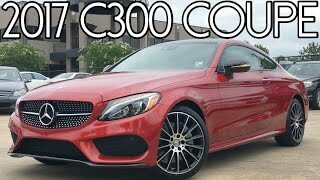 Let us have a look at the review of Mercedes Benz C300 Coupe 2017 to know about it better. The interior of Mercedes Benz C300 Coupe 2017 is truly dynamic and classy with its looks and features. Taking hints from the C-class sedan, company has given the cues a sportier ambience in this version. Though the coupe is slightly sleek form behind but gets lot of space inside due to its extended length, width, height and wheelbase. The three-spoke flat bottom steering wheel comes mounted with multi functions and looks generous sitting over elegant dashboard. There is one thing which makes the Coupe and sedan differ and that’s the console which in this case has a different console for manual transmission; however US customers will be getting automatic transmission. 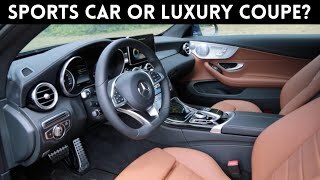 The Mercedes Benz C300 Coupe 2017 gets all its features from the sedan sibling including the upholstery options, materials used and color combinations, the only difference here making this look more gorgeous is the LED ambience and separately designed trims. 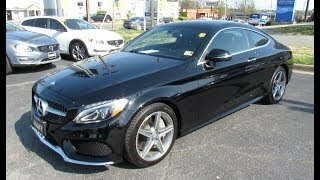 The exterior of Mercedes Benz C300 Coupe 2017 upon looking from distance might look as blend of S-Class Coupe and C-Class Sedan, but a closer inspection will highlight some changes that add silently to the gleam. Starting with the front end you’ll notice identical shaped grille sitting amidst the ‘not so new’ headlights however giving it bit of aggression is the sloppy look, which joins with the high beltline and muscular shoulder line, making it look mile ahead of its sibling. Moving towards the back you’’ notice slender taillights making way till trunk lid and repositioned license plate over the muscular body colored bumper adding to the accolades. Beneath this entire setup you’ll notice wide exhaust piped at both the ends and side vents that add to the touch of sportiness to the exterior of Mercedes Benz C300 Coupe 2017. The Mercedes Benz C300 Coupe 2017 gets a 2.0 Liter four-cylinder turbocharged engine generating total output of 241 hp and peak torque of 370 nm paired to either six-speed manual transmission or seven-speed automatic. However not much has been disclosed by the company in terms of performance of Mercedes Benz C300 Coupe 2017 but we assure you, that we’ll be sharing the information as soon as they hit the base.